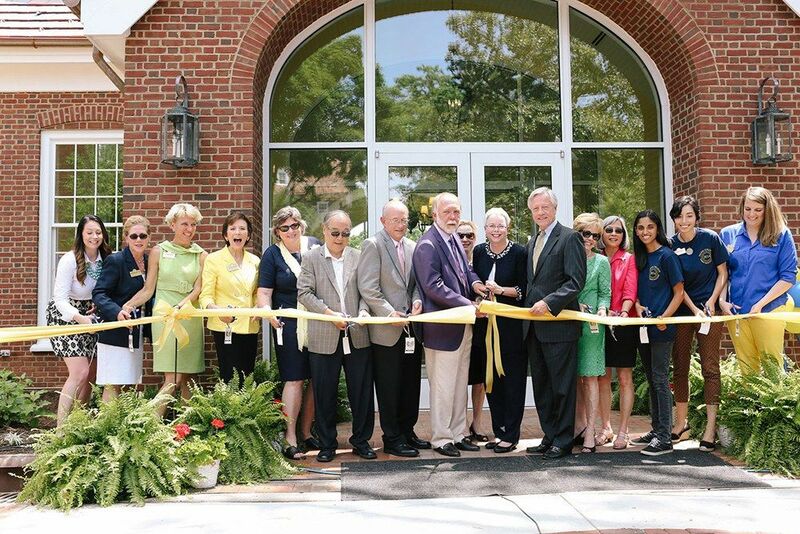 Salem College dedicated a Student Center, the first new building on campus in 32 years, on May 13, 2014. The approximately 15,000 square foot building, designed by LAMBERT Architecture + Interiors and built by Frank L. Blum Construction Company, is a central hub for students in a prominent campus location. Salem College broke ground for the $6.8 million dollar building on December 18, 2012. “It is especially appropriate that our newest building will pay tribute to one of our core values – community – and we look forward to generations of students and friends enjoying the new facility in the future,” said President Susan Pauly. The student center is a facility that fosters collaboration and community life. The two-story structure is complete with a bookstore, a café with a small performance stage, a 90-seat theater, a student lounge, meeting rooms, a student organizational workroom, student mailboxes, and abundant light! The building’s design was a challenge, says Drew Hancock, President of Frank L. Blum Construction Company, describing the project as a “ship in a bottle.” The new building appears to have been “dropped” among the existing structures as though it has been there for decades. “It was such an honor to design a new building within Salem’s rich architectural fabric. The material palette is time-tested and enduring. We introduced newer materials such as monumental plate glass in subtle ways. This allowed an open feeling not typically found in some of the historic structures, making it truly a building of the present day as well,” said Stuart McCormick, Vice President of LAMBERT Architecture + Interiors. The modern, open space is outfitted with classic details that reflect the campus’ 242-year legacy. Several historical pieces are used throughout the building, including a refurbished chandelier discovered in the attic of Main Hall, café benches, and student work tables from the Shop of William and Edward Peterson, which once stood on the corner of Old Salem and Academy streets. The oldest piece on campus, a blue-painted cupboard, or “schrank,” can be dated between 1780 and 1795 and is attributed to Johannes Krause. Other pieces have been updated with new wood table tops made from two trees that were felled during construction. Many of these pieces date from the mid to late 19th century and have previously been used elsewhere on campus. In the bookstore, a wall mural designed by Carrie Leigh Dickey, class of 2000, details Salem’s rich history as the oldest continually operating educational institution for women in this country. In the atrium, a commissioned woodcut print by well-known artist Mona Wu, class of 1996, graces the fireplace mantle. The grounds immediately outside of the Student Center provide generous outdoor gathering space. A plaza, located immediately outside of the café, provides expanded outdoor living space with tables and umbrellas. The area leading to the Student Center features a brick walkway, stone wall benches, replica gateway columns, lush landscaping, and a revived lily pond that was a gift from the class of 1928. Exiting the Student Center on the lower level, a terrace with a fire pit and water feature will provide students a gathering place and a walkway that literally connects the upper and lower campuses for the first time. “These achievements have helped us reach and exceed many of our top goals for the Student Center. I am most proud to see the goals of remaining true to our historical roots and creating flexible meeting spaces that provide functionality over time realized. We have found ways to be modern and open in the space, while employing sustainable strategies,” said Anna Gallimore, Director of Administration at Salem Academy and College. While the Student Center has strong ties to Salem’s past, it also provides for Salem’s future, with sustainability and preservation in mind. “It has been designed and constructed to sustain the well being of occupants and the efficiencies of ongoing expense while preserving the environment and our impact on the world’s resources,” said Gallimore. The Student Center project has been registered in the LEED (Leadership in Energy & Environmental Design) green building certification system published by the U.S. Green Building Council (USGBC). This voluntary guideline awards points for strategies in different categories including Sustainable Sites, Water Efficiency, Energy & Atmosphere, Materials & Resources, Interior Environmental Quality, and Innovation in Design. Completed projects are certified at four levels according to the number of sustainable strategies successfully implemented in the project. The Student Center is targeting Silver Certification pending final review by the USGBC. The Student Center will be a home for student collaboration, offering a place for Salem’s adult students and off-campus students to spend time while on campus between classes. This milestone in Salem College’s history offers abundance for the school’s future. It will enhance Salem’s ability to continue providing a liberal arts education of the highest caliber and strengthen Salem’s place as one of the nation’s premier women’s colleges for years to come.